Check Virgin Atlantic baggage size restrictions and fees before you travel. Why not give yourself a treat and ship your luggage to your destination with Send My Bag. That way you can enjoy a journey without having to wait around for your luggage or drag it behind you onto public transport. If you are moving abroad or going on a long trip, you will appreciate being able to send much more luggage than the Virgin Atlantic baggage restrictions would allow. Get your free quote and find out how cost-effective it is to send your luggage. One item of hand luggage up to 10 kg/ 22 lbs, with maximum dimensions of 23 x 36 x 56 cm/ 9 x 14 x 22 in on ‘Economy’ and ‘Premium Economy’ fares. Passengers may also bring a small handbag or small rucksack on board. 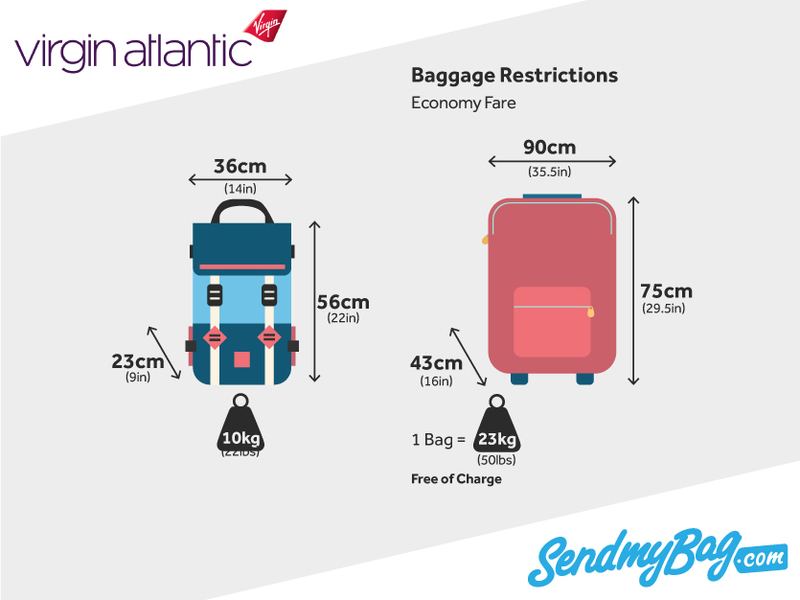 Compare Virgin Atlantic's hand luggage allowance to that of other airlines. The Virgin Atlantic baggage allowance for children is one item of cabin baggage at the standard weight and dimensions. Children over two on an ‘Upper Class’ fare are permitted the baggage allowance of two items of hand luggage to a maximum total weight of 16 kg/ 35 lbs. Infants not occupying their own seat are allowed one item of hand luggage up to 6 kg/ 13 lbs. In addition to your standard item of hand luggage, you may also bring on board: a coat, an umbrella or walking stick, a camera or binoculars, reading matter, a small amount of duty-free goods, headphones, and an infant's food. A small instrument can be brought on board as hand luggage, as long as it does not exceed the standard hand luggage dimensions or weight. Or, you can bring up to two musical instruments on board if you purchase a seat for each of them. Each instrument must not exceed 75 kg/ 165 lbs and its centre of mass must be no more than 30 cm/ 12 in above the top of the seat cushion, so that it does not fall onto another passenger. Passengers with ‘Economy Classic/ Delight’ fares may check in one item of hold luggage with a maximum weight of 23 kg/ 50 lbs, and dimensions up to 90 x 75 x 43 cm/ 35.5 x 29.5 x 16 in. 'Economy Light' passengers do not receive a free checked baggage allowance. However, an allowance can be purchased online, starting at £45 / $60 for one bag. ‘Premium Economy’ passengers may check two bags of 23 kg/ 50 lbs each. The free baggage allowance increases on certain routes. ‘Upper Class’ passengers may check three items of luggage, up to 32 kg/ 70 lbs each. Infants are permitted one 23 kg (50 lbs) bag (except in 'Economy Light') plus a fully collapsible pushchair and car seat. Overweight or oversized bags cost £65/ $100. 32 kg/ 70 lbs is the maximum weight allowance for any bag. Sports equipment that is under 23 kg/ 50 lbs and not larger than 90 x 75 x 43 cm is typically carried in the hold free of charge, provided it falls within the passenger’s baggage allowance. For items over these dimensions/ weight, an additional baggage fee will be charged. Looking for Virgin Atlantic sized hand luggage?